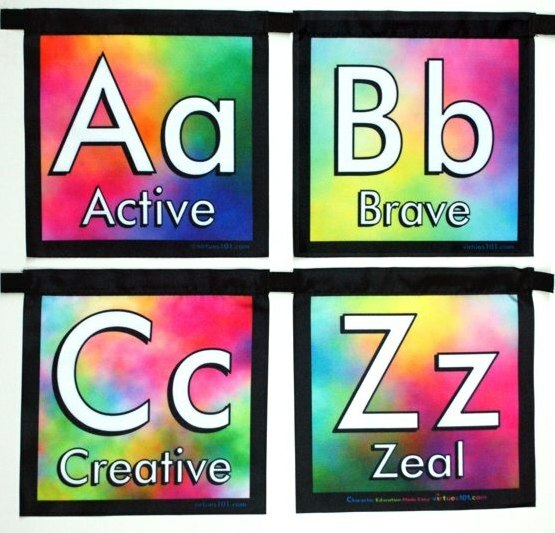 A is for Active, B is for Brave in this beautiful set of satin flags that link the letters of the alphabet to positive character traits. ABC virtue flags will brighten any classroom or playroom while teaching more important lessons than that A is for apple. Whether you are decorating a classroom, day care, or your own child’s room, these versatile letter flags will inspire and educate your children on many levels. Take a closer look. They are more than just decorations. They are creative tools that provide your child with hands-on interactions with letters, and introduce them to the names of the virtues you want them to grow up with. So before you mount them on your wall, consider letting your children connect with these letters and words through games and activities that activate the senses. They will love the feel of soft satin against their skin as they explore the shapes of the letters. They will be inspired when they learn the meaning of the words that describe the very best parts of themselves. The set consists of 26 individual satin flags that depict both the upper and lower-case version of a letter of the alphabet – along with a single virtue name that starts with that letter. Each washable flag is 7.75×7.75″ with Velcro-style tabs at the top so you can string them together in one long strand, or arrange them in any configuration you like. They also have an open hem at the top if stringing them together is more convenient. Strung together in a single line, they are almost 19 feet long! That’s enough to stretch across a classroom or run along two walls of a bedroom. Of course, the most important part of this learning tool is you. These flags are just pieces of fabric. You are the one who will bring them to life by describing the sounds of the letters, defining the virtues that are given, and then using these words as often as possible in your interactions with your children. When you teach your children the language of virtues, you empower their emotional intelligence. Giving kids the words they need to identify their virtues will help them understand the emotions that those virtues evoke. When they come to recognize how good it feels to experience these virtues, they will want to practice them more often. Need help integrating these flags into your daily ritual? 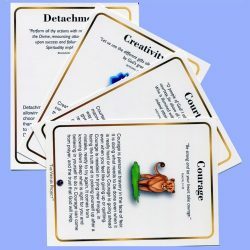 We’ve included an instruction sheet that includes games and activity ideas along with child-friendly explanations of what all of the virtue names mean. These are some of the same virtues that are included with our ABC Virtues Refrigerator Magnets. For a complete list of the meaning of those virtues, you can visit this article on the artist’s blog page. These short definitions are just a starting point. Don’t be shy about using a dictionary to look up longer definitions. It may take some thought to figure out how to describe these virtues in ways that your child can understand. As they grow, your definitions may change. Along the way, both you and they will gain a deeper appreciation for each of these qualities. If you are a parent using the Virtues Project Family Virtues Guide, you will find some overlap in virtues presented, but because we could only offer one per letter, we include many that they don’t discuss. If you are a teacher and your school is using Character Counts, then these flags will help you expand past the basic six virtues that they focus on. Many of these virtues will fall into the category of subsets of the six “pillars,” but others will expand student’s understanding of what it means to be a virtuous person.